Everyone’s talking about the labor shortage, and our industry is no exception! Working at hotels and restaurants can be exciting enough, but it can also be demanding. It’s true that most of the people we deal with are in a happy mood—they’re loving their stay in quaint Old Quebec in charming accommodations like our Hôtel Château Bellevue, they’re pleased with their business meetings at our comfortable Hôtel Château Laurier Québec in the heart of town, or they’re amazed at what our caterer George V can do to make their weddings or conferences unforgettable events. But the fact remains that we’re open 24/7, and that can be a tall order. We have a wide range of positions to fill, including reception, housekeeping, maintenance, kitchen, bakery, event setup and teardown, concierge, valet, accounting, marketing, and sales jobs, all of which require availability, commitment, attention to detail, and the ability to deal properly with suppliers and clients, often in a second language or in difficult situations. All too often, these jobs are misunderstood and undervalued. Sure, we make it look easy, but that’s an illusion—we’re actually hard at work behind the scenes. It’s not computer engineering or neuroscience, but these jobs are worth their weight in gold because they allow our society to attract and accommodate tourists who, year after year, contribute almost $10 billion to Quebec’s economy, more than half of which comes from outside the province. So it can be frustrating to see how little interest some public and broader public organizations show in recruiting and training workers to fill these positions. But as employers, we also share some responsibility. Recruitment is a never-ending process for us. We’re always on the lookout for qualified people interested in working at our establishments. For students, our main approach is internships that provide valuable on-the-job training. Fortunately, a number of schools have set up co-op programs specifically for this purpose. Of course, taking on interns requires preparation, so our Front Desk Mannager has taken training at the Fierbourg vocational training center to make sure the experience students get is in line with the school’s expectations and to maximize the value of their diplomas upon graduation. However, finding workers to fill these positions is a real struggle at the moment, especially for baking and pastry jobs. In addition to Quebec educational institutions, it’s become abundantly clear that we’re going to have to look abroad to meet our recruitment needs. 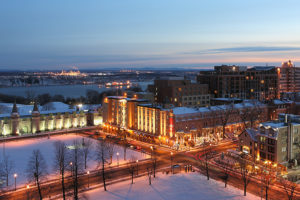 For that to work, those in charge of setting immigration rules, recruiting workers from outside the country, and issuing work permits will have to be much more sensitive to the needs of our industry and, in turn, companies will have to do more and invest more to integrate immigrant employees who choose to start a new life and career in Quebec. That’s how I see it at least, and I think we’ll be participating more and more in activities held by organizations such as Québec International in order to make sure our needs and expectations are better understood. The size and family atmosphere of our facilities make them pleasant and friendly places to work, and they offer very competitive job conditions to boot. We’re doing more and more to promote our company and to highlight our quality work environment and atmosphere, and we encourage our employees to recommend relatives and friends who might be interested in joining us. Despite all the benefits and all our efforts, and despite being in a relatively good position compared to other companies, nearly half of our housekeeping and accommodations staff has been with us for less than 18 months. It’s clear that if we want to continue developing new tourism markets, we’re going to have to act quickly to develop new ways of attracting staff. There are many ways to attract people who would be happy to work and make a career in our industry. Internships, great work conditions, immigrant integration programs, and technology (for repetitive tasks) are among the many solutions we will have to consider to further the growth of our company, the region, and Quebec as a whole. If you know anyone looking to work at a hotel or restaurant in Québec City and who wants a nice, friendly workplace, by all means refer them to our human resources manager, Yannick Savard, who will be glad to answer all their questions.